President Barack Obama has said that some Americans may oppose him because of race, but that this has not been the main factor behind healthcare protests. He suggests, in TV interviews to be broadcast on Sunday, anti-government sentiment was the key reason for angry protests against healthcare reform. Former President Jimmy Carter said this week that much of the vitriol against reform plans was "based on racism". Many felt "that an African-American should not be president", he said. Mr Carter made the point after Republican lawmaker Joe Wilson shouted "You lie!" while Mr Obama was delivering an address on healthcare to Congress last week. Recent protests against Mr Obama's healthcare reform plans have included angry town hall meetings and a taxpayers' demonstration in Washington last weekend. Some have accused Mr Obama of tyranny and promised to "reclaim America". 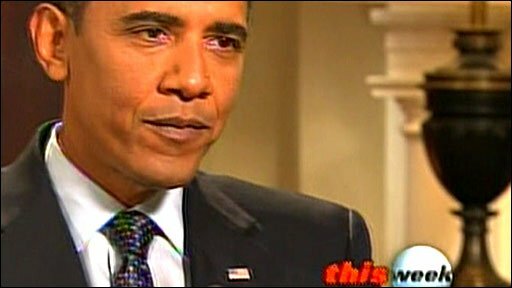 In comments to ABC, Mr Obama said race was a "volatile issue" and "it becomes hard for people to separate out race being a sort of part of the backdrop of American society versus race being a predominant factor in any given debate". "Are there some people who don't like me because of my race?" he said. "I'm sure there are. "Are there some people who voted for me only because of my race? There are probably some of those too. But he added that he thought some were "more passionate about the idea of whether government can do anything right. "And I think that that's probably the biggest driver of some of the vitriol." He also said he was not the first president to come up against angry protests. "The things that were said about FDR [Franklin Roosevelt] were pretty similar to the things that were said about me - that he was a communist, he was a socialist," Mr Obama said. "Things that were said about Ronald Reagan when he was trying to reverse some of the New Deal programmes were pretty vicious as well."